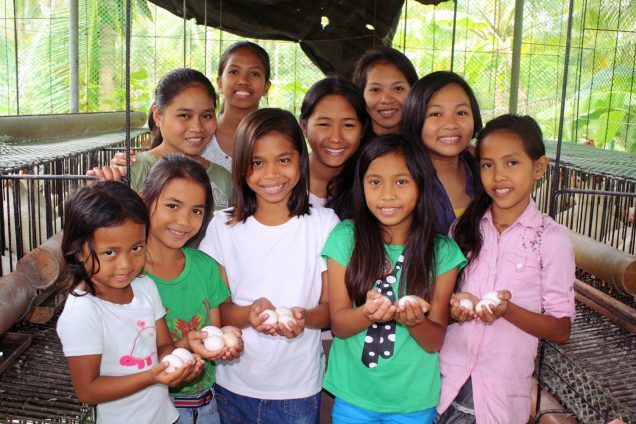 Photo: Students at our main campus are happy to show you eggs yielded from the newly renovated hen house. In November we brought you news of Typhoon Hayan, one of the worst storms in history, making a direct hit to the island on which our native team faithfully operates. We had told you we committed to helping 21 families who had lost everything. Thanks to your support, work is coming along and we’re helping these families to slowly rebuild and get their lives back together. One thing that has helped provide these families with sustenance is the steady flow of eggs from our hen house, allowing an important high-protein ingredient in their diets. Fortunately we had just renovated the hen house using storm-proof materials just weeks before the storm hit. The renovation included an expansion that has helped us increase egg production. Thus the house was able to survive the storm, and the hens, although a little wet, were all in good condition. The hen house is part of our farmland small business enterprise that equips our team with wholesome ingredients and profits to care for the local impoverished populations of Cebu and Manila. Our banana farm produces over 6,000 bananas per year, and our hen house yields 20+ dozen eggs per day. Our soon to be completed fishing pond shows great promise in producing another nutritious ingredient for the meals we serve, not to mention profits to be earned from excess stock being sold.